Limited to 1500 copies?? No—the world needs more!! Ok, so it’s the third edition (plus the first edition had two reprints) but that means only one thing: there’s demand for it. 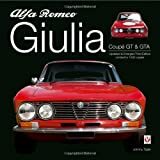 Each time the book has been reprinted, more material was added, not because something was overlooked in the first one of 1992 but because the little Giulia had done more things—such as historic racing—that were worth recording. That said, there really could be more in the book, namely about design and development, especially since from the beginning this book has presented itself as “the” book on the subject. 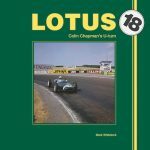 Only 30-odd pages are devoted to this important aspect whereas another hundred and thirty look at competition in period and historic racing. On the other hand, this was the absolute first book this publisher ever produced so they may well have been learning as they went along to become one of the powerhouses in automotive publishing. At any rate, even if you have any of the other two editions, you’ll want this one. Over a hundred more photos, larger format, tweaks here and there—what’s not to like? And what’s not to like about the lovely 1963–1977 Giulia, a success right of the gate and all through its production life. 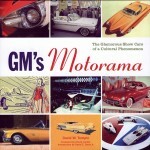 After reading this most sympathetic book you’ll probably have the urge to run out and buy a car. Better be quick because they’re moving up in the marketplace, even the once rather overlooked Berlina saloons. The latter are not covered here but some other models based on the Giulia platform are briefly touched upon, notably the exotic Montreal and Sprint Speciale and TZ. The Foreword is by Andrea de Adamich, who actively raced from 1962–74 and for many of those years was Alfa’s official works driver. He owned a road GTA as well so knows the cars from both ends of the spectrum. (The photo here shows him wearing glasses and it may be worth pointing out that he was one of the few F1 piloti to have worn them while racing.) His verdict: “A well preserved GT from the late ‘60s has nothing to be ashamed of as far as form and performance are concerned when compared with cars designed and sold in recent years.” He should know because he’s still involved with Alfas, as VP of the N.Technology racing team that originally was created to manage the worldwide sporting activities of Fiat Group and, among other things, preps racecars for Alfa. Tipler too comes by his Alfa insights the honest way: he’s owned a gaggle of them, of different vintages and flavors and he’s been writing about them for a long time. 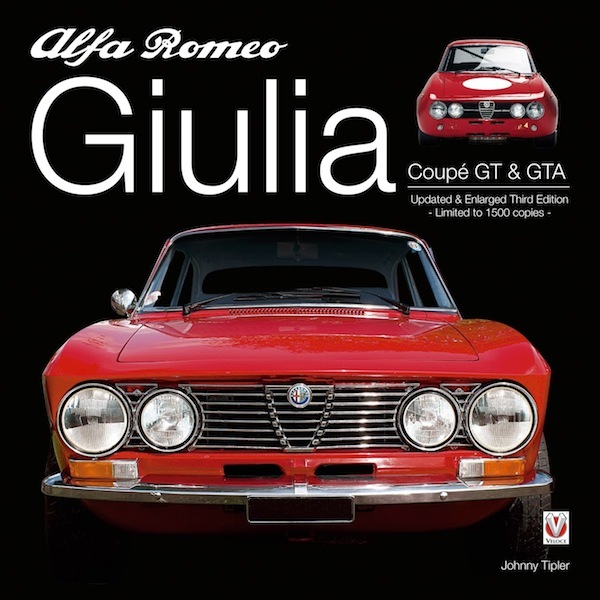 On a few pages he sketches the early history of Alfa and then zeros in on the role of coachbuilder Bertone and their famous BAT cars and, more relevant to the story, the 1954 Sportiva that influenced Alfa’s Giulietta that preceded the cars this book is about. The novice reader will probably find the nomenclature of the cars (model names vs. series numbers) a bit confusing and may want a general, overall Alfa history handy. A chapter devoted to the GTA competition car of which only 1000 were built precedes one about racing highlights in period, and a restoration chapter (focus is on the coupe with a very few remarks about the cabrio) precedes one about historic racing. 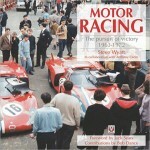 The resto chapter features the work of UK Alfa expert Mike Spenceley (as opposed to the late Malcolm Morris in the first edition) who advised Tipler on his last two Alfa books. All the resources listed here and in the appendix are in Europe and mostly in the UK. Several exploded illustrations from parts manuals are shown, along with a cutaway of the iconic twin cam engine and a whole 1750GT. A final chapter presents a longtime Brazilian GTA that happened to be in the UK for work. Appended is a surprisingly long list of Giulia and derivative model cars as well as production figures, ads/sales brochures, a specialists directory, road tests (interestingly, one of the data points in a 1968 Road & Track test is “Parkability” [“gap needed to clear 6 ft wide obstruction parked in front”], something you no longer hear about), pages from a brochure by coachbuilder/customizer Harold Radford (singing the praises of “Freudenberg PVC” or a “Cleopatra rear bench”! ), the GTA homologation document (in Italian only) and, lastly, two paintings by Anna-Loise Felstead and Tipler-mate Anthony Fraser’s GTA art t-shirts. Some ribbing is unavoidable, although the author may not be at fault here because some of the more peculiar typos pop up in copy the publisher may have added. Granted, “Giulia” is easily misspelled. A straight-up transposition of letters by sticky fingers on the keyboard is one thing (among others p. 216) but on the very next page, a painting has it wrong too (p. 217)! But “Gulia” (p. 201) fails to amuse. Long out of print, it’s nice to have this book in circulation again but remember: limited run!